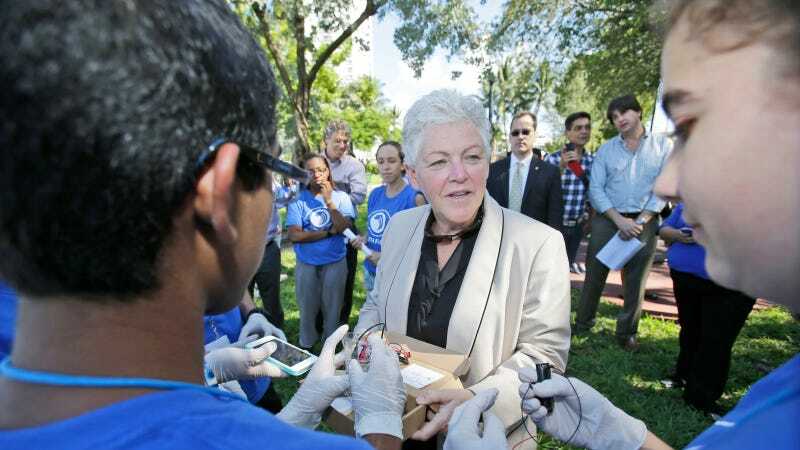 To kick off her speech about climate change at an event on Miami Beach, Environmental Protection Agency administrator Gina McCarthy started with an apology. "I want to apologize for my generation. We didn't quite get it quick enough. And so when we started looking at climate data decades ago, we knew that climate change was a problem, and all we could do was project the impacts," she said. "Today, we're not projecting, folks. Today is about experiencing the climate impacts, up close and personal." The Biscayne Bay, which separates Miami Beach from the City of Miami, was at its highest point of the year, thanks to the annual king tide. A temporary pump system was busy pumping the salt water that regularly floods the streets in the area during these high tides back into the ocean. "Climate change isn't about faraway places in faraway dangers, it's about impact today to the the safety of our communities, to the viability of our commercial enterprises, and most importantly it is about the public health of the families across the United States of America," she continued. The event was a major gathering of local and national politicians who have recognized that climate change is no longer an issue up for debate, but a critical reality that must be dealt with. Nowhere in the U.S. is the impact of rising seas already being felt as acutely as the small city of Miami Beach, leaders said. Nor has any city been as proactive about addressing the issue while it is still manageable. "This ocean, this bay right here, is not Republican, it's not Democrat, it's not Hispanic, it's not African American, it's not white. It's all of us," Miami Beach Mayor Philip Levine said to the crowd while highlighting the efforts the city is undergoing to combat the increasingly intruding salt water. Around $500 million will be spent in the coming years to combat the issue in the city. "This ocean doesn't care, this bay doesn't care." Levine highlighted the fact that only a year ago, he filmed a campaign commercial in the street behind the crowd, while riding in a kayak. "Today, you can't be on a kayak on [that street]," he said, referencing the successful (but costly) efforts to pump out the salt water. "We hope that Miami Beach serves as a model for other communities around the world that realizes you cannot ignore this." However, state and federal politicians are ignoring climate change despite the fact that residents are actually living through it, said Cindy Lerner, a local politician and committee vice chair for the League of Cities, an organization that helps bring national attention to local issues like rising seas in South Florida. "We in local government are where the rubber meets the road," she said. "[But] we live in a state where we have a legislature and a governor who are climate deniers, who are not taking the responsible role of legislators and administrators to do what needs to be done for this state." Indeed, on the local level, planning for and mitigating the effects of climate change is a bipartisan issue. "Sustainability has become an economic issue," Miami-Dade County Mayor Carlos Gimenez, a Republican, told a crowd here last week at the Southeast Florida Regional Climate Leadership Summit. "We need to ensure investors and business people that we are doing everything we can to mitigate climate change." "If there are any doubters, you should listen to the NASA scientists that testify that measurements—that's not forecasts, that's not projections, it's measurements—over the last 50 years [show] five to eight inches of sea level rise in South Florida," said Senator Bill Nelson (D-FL). "75 percent of our population in this state is on the coast. The projections are towards the end of the century it could be an additional two to three feet if we don't change our policies. That means that most of the population of Florida will be inundated, and I don't think we want that. It's time for people to wake up." Also addressing the crowd was Senator Sheldon Whitehouse (D-RI), who spoke of the similar issues his home state is facing, with measurements showing 10 inches of sea level rise over the last 50 years. "Our nickname [in Rhode Island] is the ocean state," he told the crowd. "If we can push back on the denial we can solve the carbon problem, and we can protect our coastal way of life." "No one should ever think of environmental and public health challenges as a partisan issue," EPA Administrator McCarthy told Fusion. "Long term it would be great to have congress speak to these issues, but in the short term we are providing support for these communities." "The question should not be about whether climate change is happening, but about what actions we can take and how quickly, and how we can support that effort," she said.